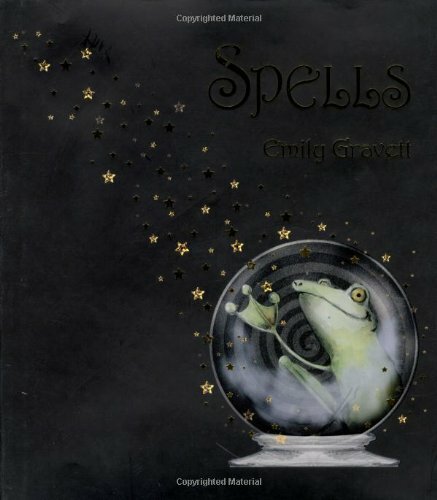 The endlessly inventive Emily Gravett (or Emily Gribbitt, as she is credited inside the book) here once again explores the extent to which she can playfully subvert the physical form of the book itself to develop a narrative. This is a beautifully produced book. The pictorial dust jacket hides an exquisite gold embossed binding, perfectly reflecting the play on traditions of classic storytelling. The wrapper itself features brilliant gold reflective lettering and shiny spot lamination picked out on a matt black paper. A concept such as this cannot adequately be described in words. It is entirely visual and depends on the interaction between reader and paper. Suffice to say, the frog hero’s chaotic struggle to find a successful formula to transform himself into a handsome prince is represented through multiple option split pages. What Gravett lacks in traditional drawing skills she more than makes up for in sheer invention and self-referential post-modern humour.